SHOP TALK MMS OCTOBER 2018 48 mmsonline.com Industry News Omax Celebrates 25 Years, Displays New Products at Open House BY JULIA HIDER | CONTRIBUTOR Omax had more to celebrate at its recent open-house event than its 25 years of business. In addition to its original Omax line of waterjets and its custom- izable Maxiem solutions, the company showcased its latest product offer- ings, which include the GlobalMax JetMachining center for international markets as well as the Protomax personal abrasive waterjet designed for prototyping and other forms of low-volume cutting. The compact, self- installed Protomax can cut anything the company's larger models can, including glass and 1-inch-thick stainless steel, albeit a little slower. These two product lines enable new groups of users to experience these benefits, including those in international markets, job shops, the maker movement and classrooms. The anniversary event included tours of the company's 225,000-square- foot facility in Kent, Washington, where it produces waterjet machines. According to Vice President of Marketing Stephen Bruner, Omax makes 70 to 80 percent of the parts for its machines in house. 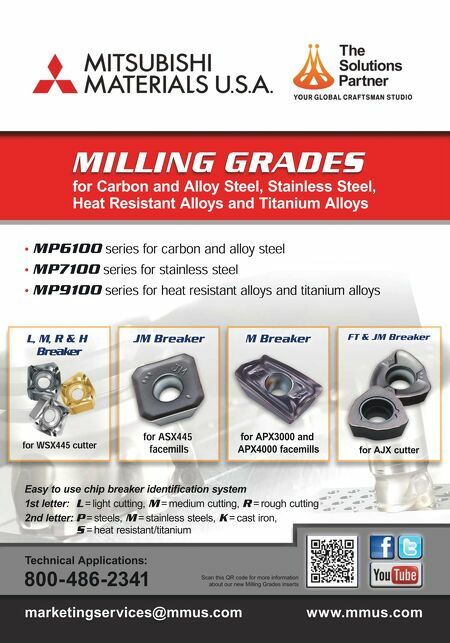 These parts are made on a combination of traditional machine tools and the company's own waterjet machines, illustrating how shops can use waterjet technology as a comple- ment to other methods of metalcutting. Demonstrations included the A-Jet cutting head, which has five-axis capa- bilities to produce bevels, and waterjet software products, which include Layout for creating 2D parts and tool paths, Intelli-CAM for 3D models and tool paths, and Make for loading tool paths onto the machine and cutting. 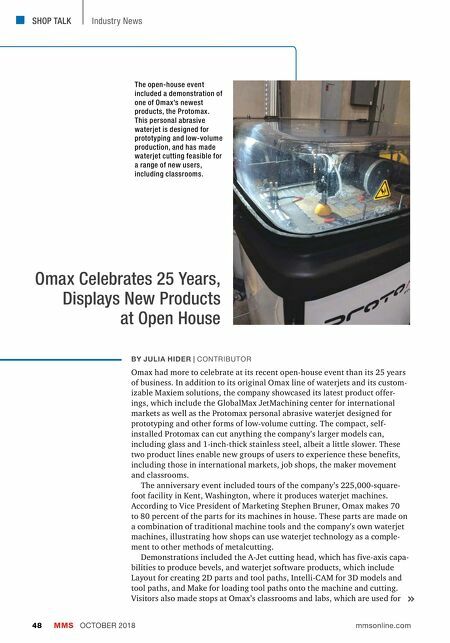 Visitors also made stops at Omax's classrooms and labs, which are used for The open-house event included a demonstration of one of Omax's newest products, the Protomax. This personal abrasive waterjet is designed for prototyping and low-volume production, and has made waterjet cutting feasible for a range of new users, including classrooms.